This past weekend our family had a great time in Charlotte for FT4RL2. It was a really fun chance to connect with people, familiar and new, who play (or want to play) this game that gives us so many great opportunities. Bonnie The Frugal Travel Lawyer covered money-saving and booking tips for lower-cost airlines and revenue-based programs. She also gave some great info on saving money on car rentals and shared some of her expertise on hotel programs. Leslie from Trips With Tykes wowed us with her Disney prowess and did a great job of sharing why, how and when to visit the various Disney parks and properties to get the most out of it at the lowest cost. Wow, we went to Disney World in Florida in 2010, and it sounds like a different world there now! Jason Steele, who writes for many sites, helped us with some of the problems that many of us run into once we accumulate some miles: how to put them to use and get the seats we want! He had some great tips that we already use like leveraging our inflexible schedule to book early, and others we haven’t used as much yet. Shawn who writes Miles to Memories inspired us with stories of his family’s adventures and experiences and challenged us to have a positive impact in the communities that open their gates, doors and hearts to us. The growing industry of voluntourism is much larger than I’d have ever guessed, and he showed how much we can do to help at little or no additional cost while we travel. A huge thank-you goes out to Dia who put together the first Family Travel for Real Life conference as well as this one, and who did an amazing job of organizing the event and keeping it rolling smoothly. If one comes to a city you can get to, I definitely recommend attending! As The Joe Flies also recorded a couple of podcasts including a really cool one that included many of the attendees, not just the bloggers! Also, Points With a Crew blogged live during each presentation. How, I have no idea – he’s a machine! The real magic of a get-together isn’t in the presentations, however. It’s before, after and in between presentations as the ideas shared grow into the unique solutions that fit each person and family’s needs. Especially with family travel, one size never fits all! My primary goal was to open people’s eyes and minds to the fact that miles and points make it possible to forget what you may have thought about traveling and vacations. We can earn our way to far more travel, on totally different schedules, than any sane person would think to pay for. Even with 4 or 5 or 8 passengers, we can find ways to take that once or twice a year Disney trip or beach getaway or epic adventure trip, AND we can also use long weekends and short trips to explore other areas of every kind with our kids. Prioritize: is this a trip we definitely want to take, or one that we’d like to fit in ‘if it works out’? If it’s the former, we will use which ever miles will work, as early as possible. The chance of cancelling or changing schedules is minimal. As I talked about, Saver level seats may not exist for a destination like Alaska (they never did from the cities I was watching for this summer), but by collecting so many miles we don’t have to care about the ‘higher’ price. Alaska is worth paying 20K miles each way to share with your kids! If it’s a trip we want to take but aren’t sure about when it will work out, we’ll try to use Southwest points or AA miles so we can take advantage of their free date changes if needed. If it’s a trip we’re unsure about, we’ll book on Southwest or with BA Avios as early as possible. Maybe even to multiple destinations! Cancellations are free (taxes are refunded with Southwest points, they are not refunded with BA Avios), so there’s no reason to wait! If they serve your airport, Southwest is a program I recommend you earn some points and a companion pass in, even if you would rather fly on another airline. The ability to make these speculative bookings is just so valuable! Next we book the best deal we can find for a prepaid hotel reservation with free cancellation. Using the Barclays Arrival Plus card. This hotel booking is often a placeholder we intend to replace with a better one, but it keeps us up-to-date on the travel costs that we might need to offset, and it protects us from rate hikes that might happen if you unknowingly book when a major event will push hotel prices up. I also talked about our approach to earning miles points and cashback along with the result – trips last year to Alaska, Hawaii, Yellowstone, San Diego, Israel, Barbados and Charlotte as a family of four, along with trips without the kids to Phoenix and Roatan, for negative $1575. We call the approach that made this possible ‘opportunistic hoarding’. If usable miles, points or cashback are available for minimal cost, we take them! We pretty much ignore little incentives like one extra point category bonuses, since we can earn on average 11-18 points per dollar on ALL spending by putting all of our spending, regular and manufactured, toward signup bonuses and larger promotions. The idea that you will run out of worthwhile bonuses in a short time is just silly, and I shared some of our application history to show that, with over 60 new accounts between the two of us over two years and no shortage of great offers available to us now. For another look at a similar approach that keeps a couple traveling full-time, check out this post at travelisfree. If you’re new to all of this, I recommend this Miles to Memories post – we do move pretty quickly but remember that it’s not a race! This approach is not for everyone! If you have credit card debt, or if you don’t have the organizational skills to track and stay on top of multiple accounts, it can easily cost far more than any benefits would ever be worth. Please, proceed with caution! Particularly when Citi is involved, common sense does not apply. If you are eligible for an AA Platinum card, get that first and count it as your first AA card application for timing future applications. While approval rates have been very high, they aren’t 100%. I got denied for one, and others have as well. Usually after getting several. I gave Citi a break for a couple of months and then had no trouble getting another card. Our approach will result in the occasional denial – we play to get a lot of hits, not to bat 100%! Unless you are getting your first Executive card, there are very specific link(s) to use. You can find the current working link on my Credit Cards page (no affiliate links) or in the wiki of this FT thread. You can see how this offer came onto the scene last year in this FT thread, it’s worth reading. Particularly pages 5-25. Other than the specific link and the bonus and statement credit amounts, nothing has changed since then. For the most recent datapoints you can check here in the current thread. I mentioned booking hotels with AA miles. This is almost never the best use for them, but if you’re AA-miles-rich and cash-poor, go for it! Just be sure you log into your account at useaamiles.com or you’ll see the incorrect (much higher) price. This is just one offer! We took a break last year from applying for these and got other cards instead, without changing the fact that each of us opens a card with a worthwhile signup bonus at least every two months. For a list of credit cards’ current churnability, check out this post by Doctor of Credit. Just be sure to always check for current datapoints before applying – if you aren’t sure there are several forums including Flyertalk and Saverocity Forums where you can ask any specific questions. Travel costs include all airfare, lodging, car rentals, taxis, tours, cash withdrawals made before trips, pet sitting, you name it. If it’s a cost we wouldn’t incur while entertaining and feeding ourselves close to home, we count it as travel. I also mentioned reselling but I’m certainly no expert there – for great info, updates and reselling opportunities I recommend following Big Habitat. 2014 – 9 trips, 46 segments, and 50,000 miles of fun! Map courtesy of Great Circle Mapper. Like any hobby, this one requires some dedication and discipline to get these kind of results. But I can’t think of another one that would enrich our family more! 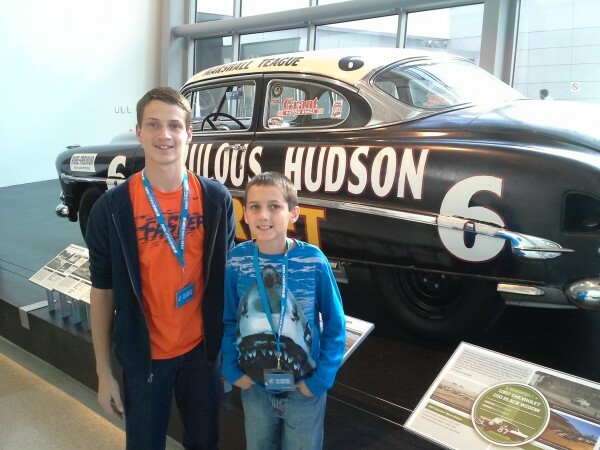 Our boys had a great time at the NASCAR Hall of Fame during the extra half day we had in Charlotte. If you ever take kids there, definitely get them the unlimited simulator rides with their tickets! Having missed FT4RL2 (and 1, for that matter!) it is fun to hear about your presentation and your strategies. Thanks for the write-up! It was nice meeting you this weekend Kenny. Thanks for all of the great information! Great meeting you too Kenny. Hope to see you at FT4RL3! Great meeting you and your family this weekend. Keep making those wonderful memories. And thanks for the recap and links. Wow. Just Wow. So grateful you could make it! So are we. Thanks for all your work! Great seeing you Kenny! And I enjoyed your presentation as well. Previous post: Freeze ARS and IDA credit reports the easy way!